In partnership with the Asian Pacific American Heritage Collaborative, the 1882 Foundation is coordinating a tour on Nov 8 and 9, 2018, focusing on Chinese railroad workers who helped build the transcontinental railroad in California. The 2-day overnight tour starts in Sacramento (or San Francisco), and the highlight of the tour is at the Summit Tunnel in the Sierra Nevada Mountains. The $250/person, 2-day tour includes guide, lodging, and transportation, which includes a train ride following most of the historic route. For more information, go to the links below. Deadline is Oct 22, 2018. Switching to new map embed program (ArcGIS), which allows for more display features (land ownership, trails, parking, etc.) and coordinated mobile app function. See “Plan a Visit” tab for mobile app. Added new pictures to existing sites. 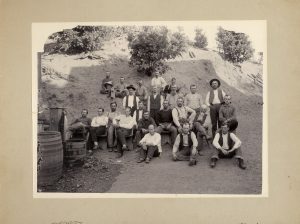 A historic photo of a La Grange Mine crew that depicts a Chinese man sitting in the front. Courtesy Trinity County Historical Society. USDA Forest Service and Chinese Historical Society of America are proud to launch ExploreAPAheritage.com, a new website created in partnership with the APA Heritage Collaborative. The goals of this collaboration are to bring support for conservation efforts, and inspire a new generation to conserve, explore, and interpret historically significant sites in California and Nevada. We invite you to discover stories buried deep in these historic mountains, ghost towns, beaches and coastlines. Begin your journey by exploring our sites here. On each site, you will find historic overviews, travel information, maps and photos to over 50 heritage sites. Then plan a visit to these sites with our tips and pointers. Let us know what you think! Contact us on Facebook, Twitter, or through our contact page. What secrets will you find?